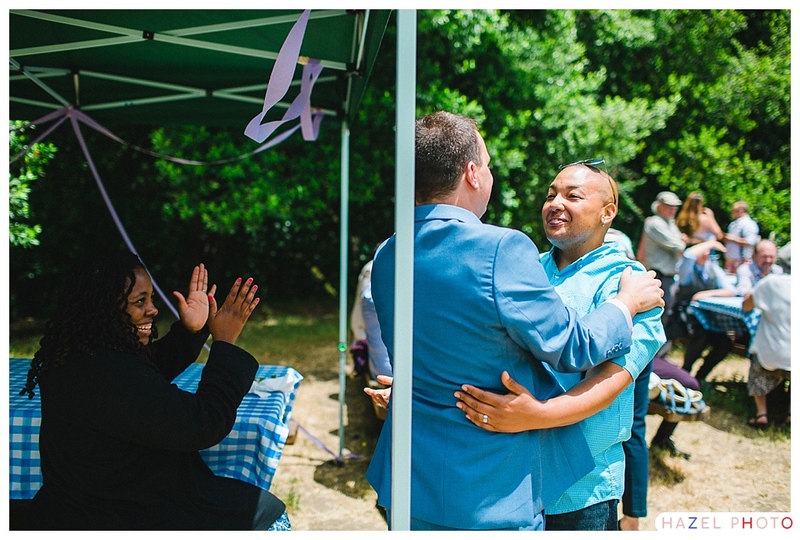 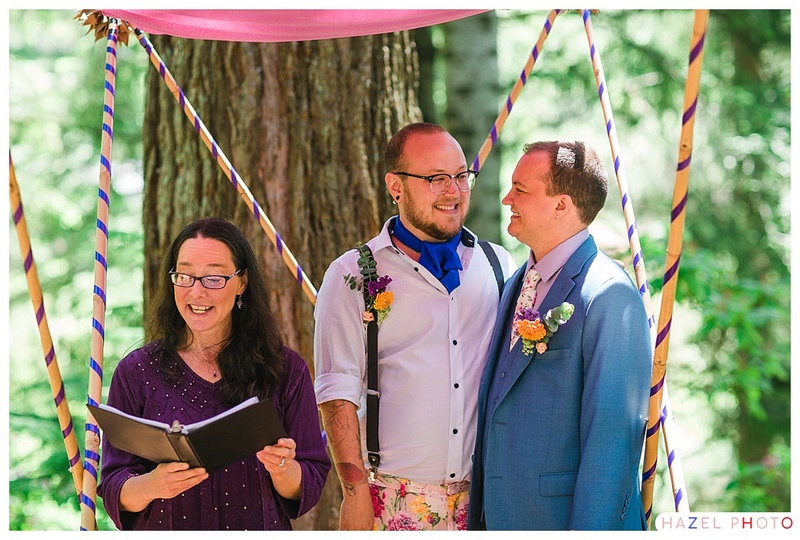 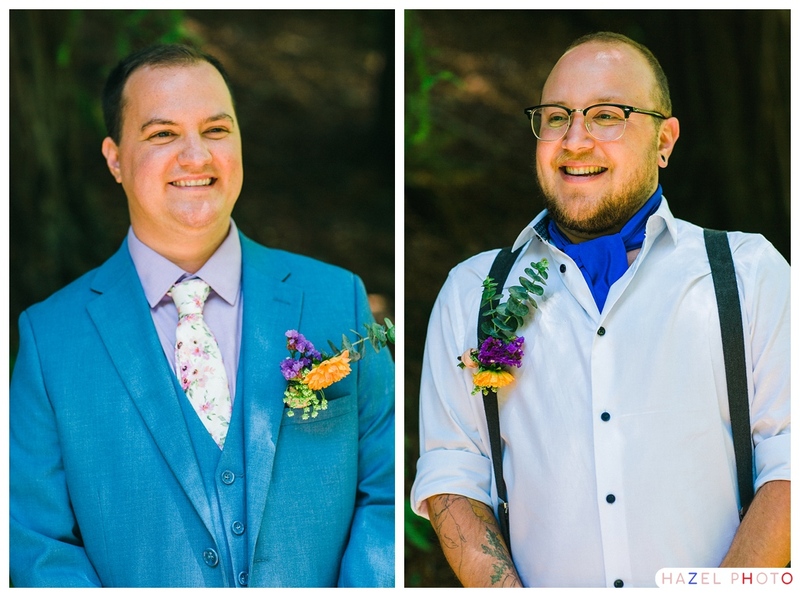 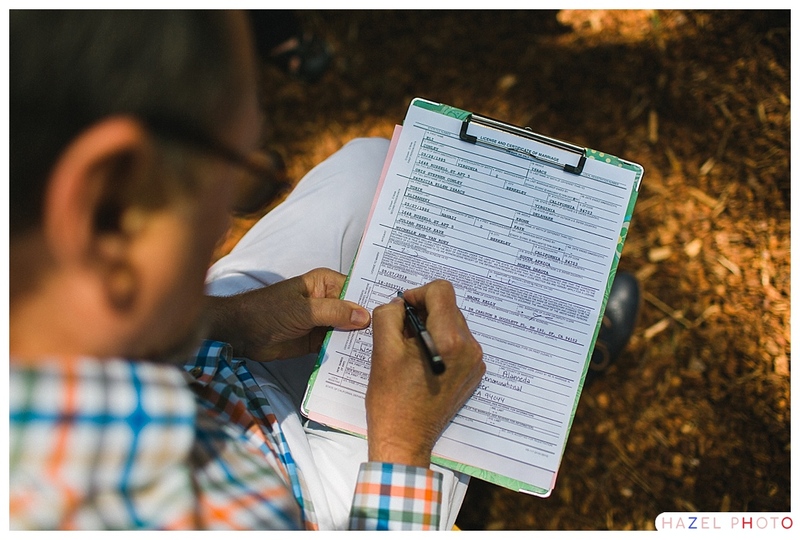 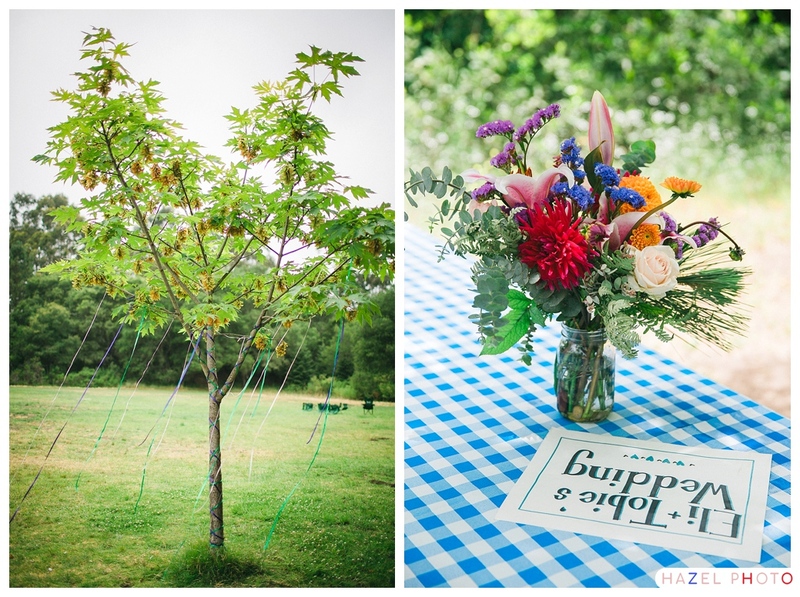 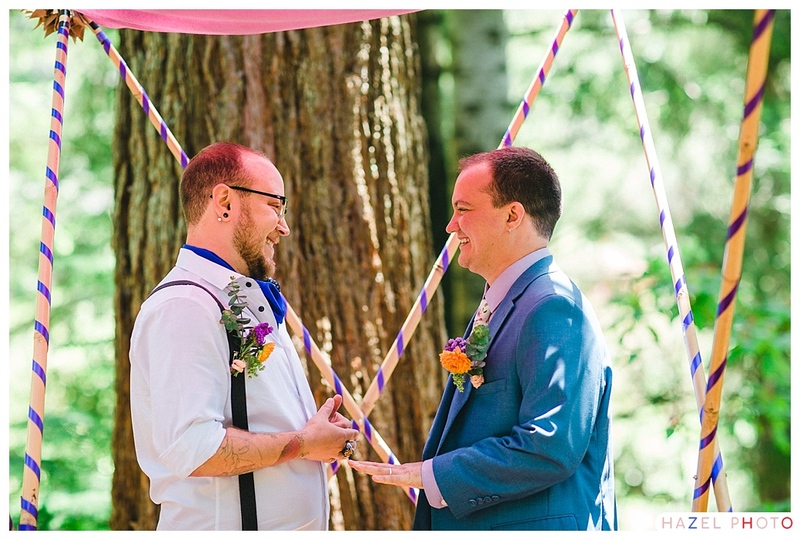 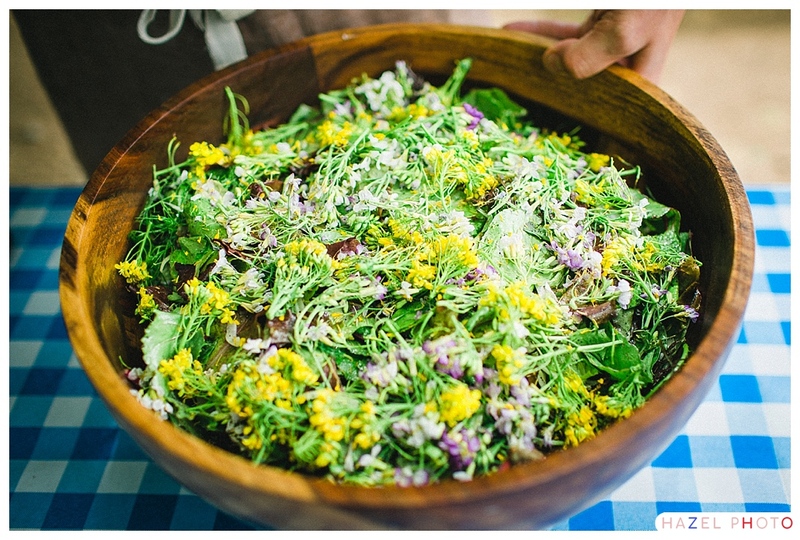 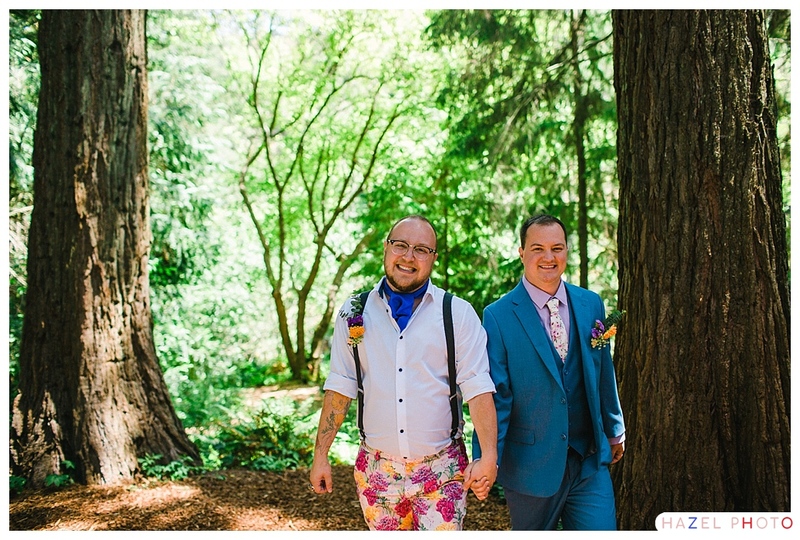 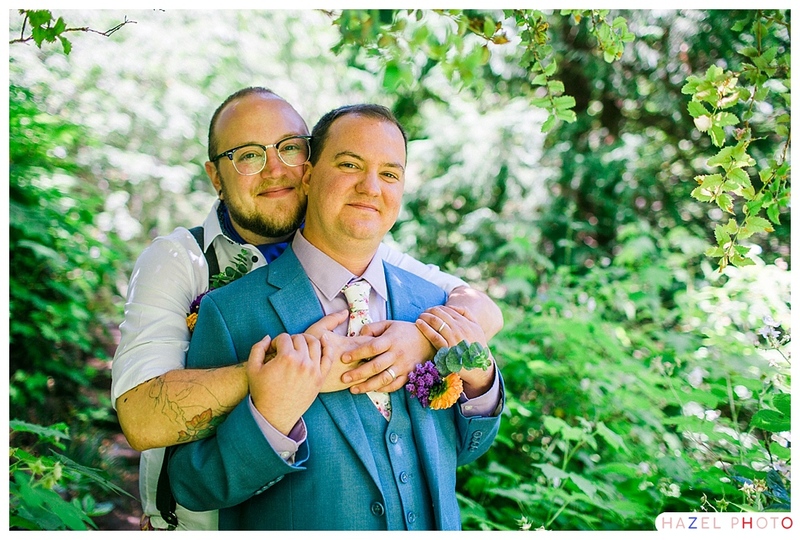 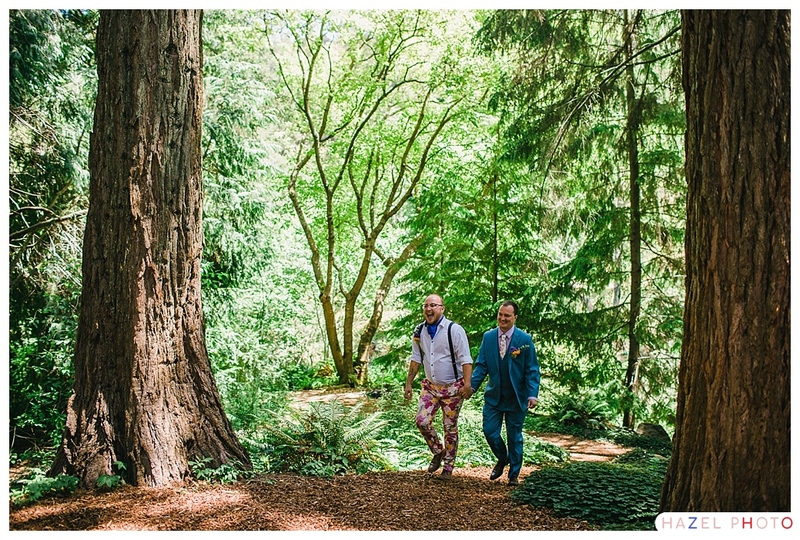 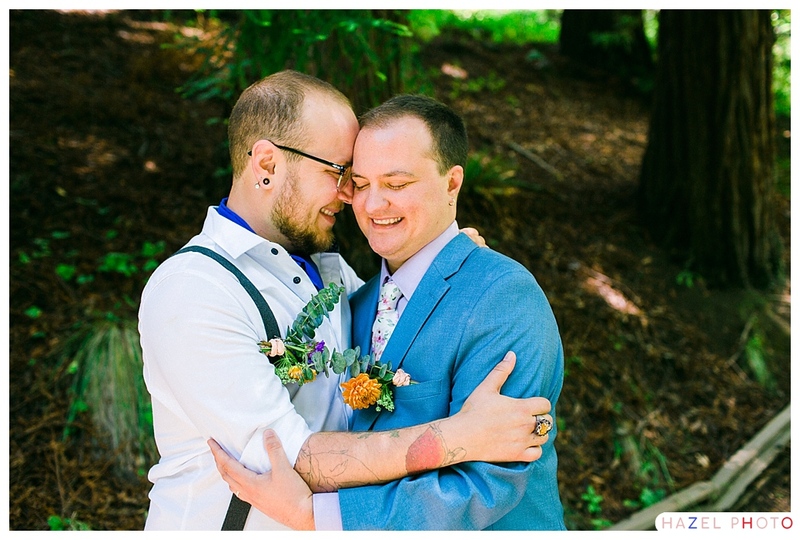 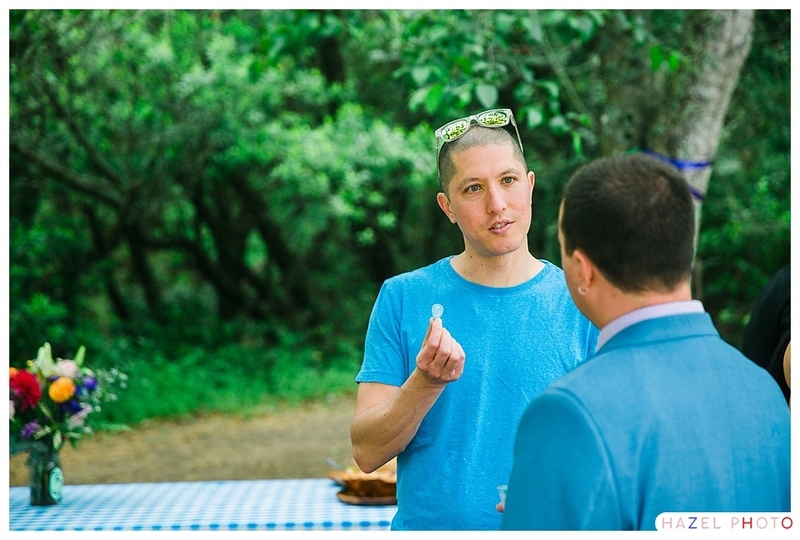 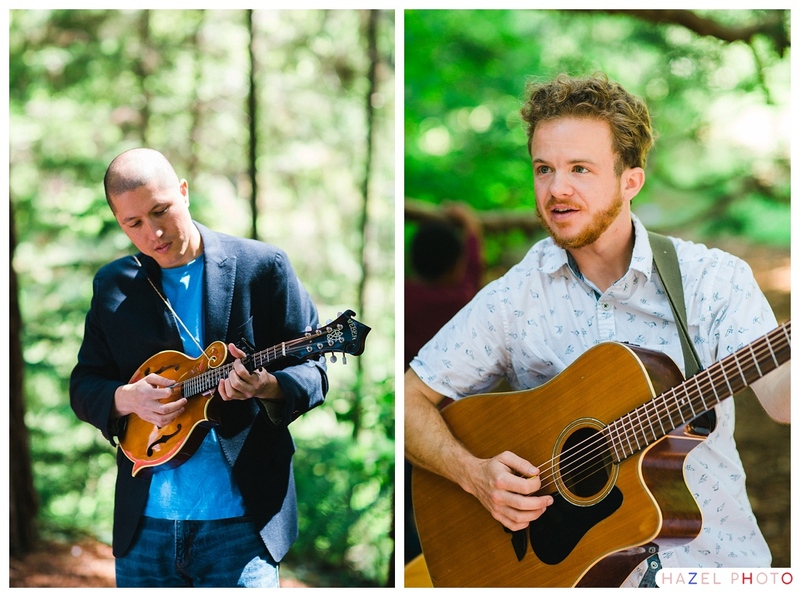 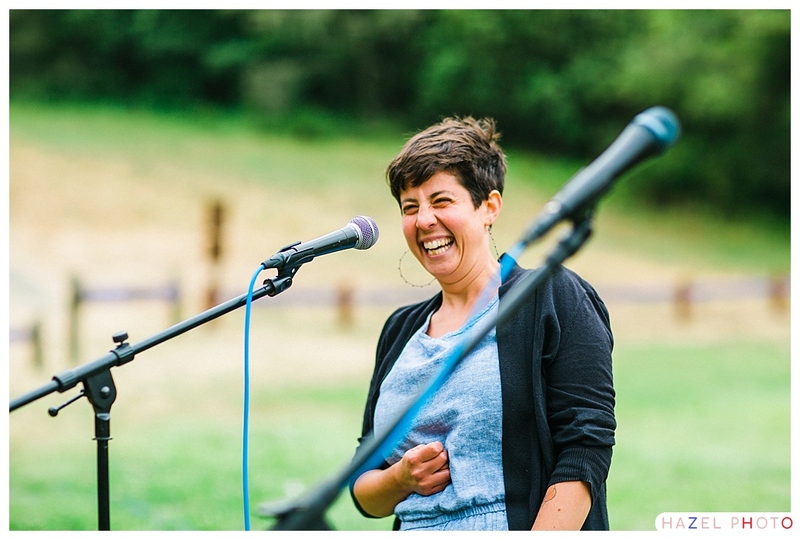 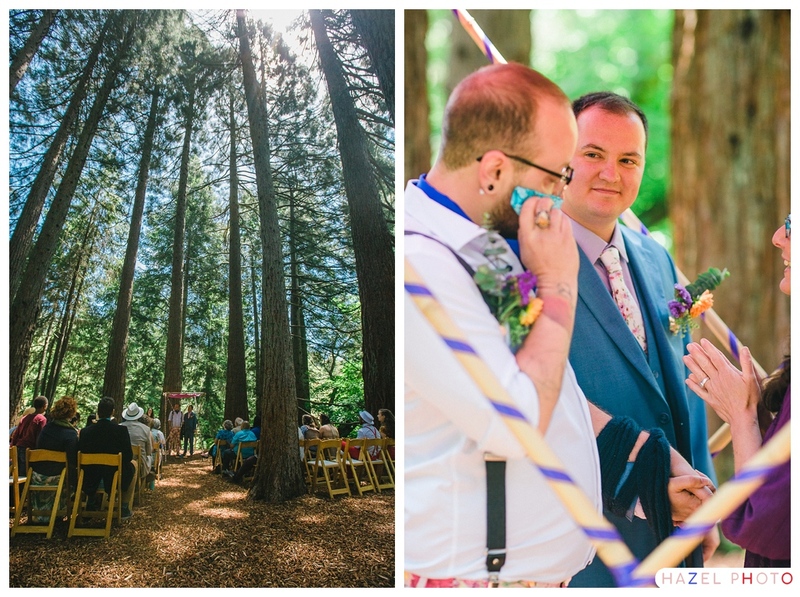 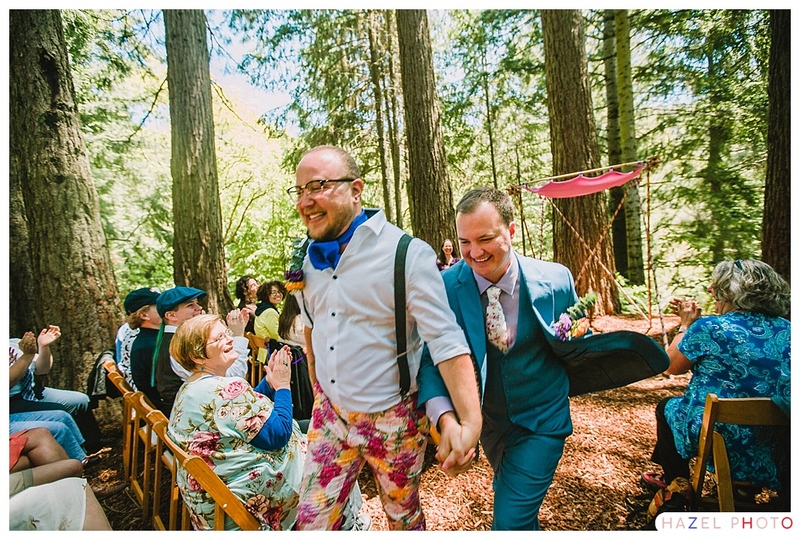 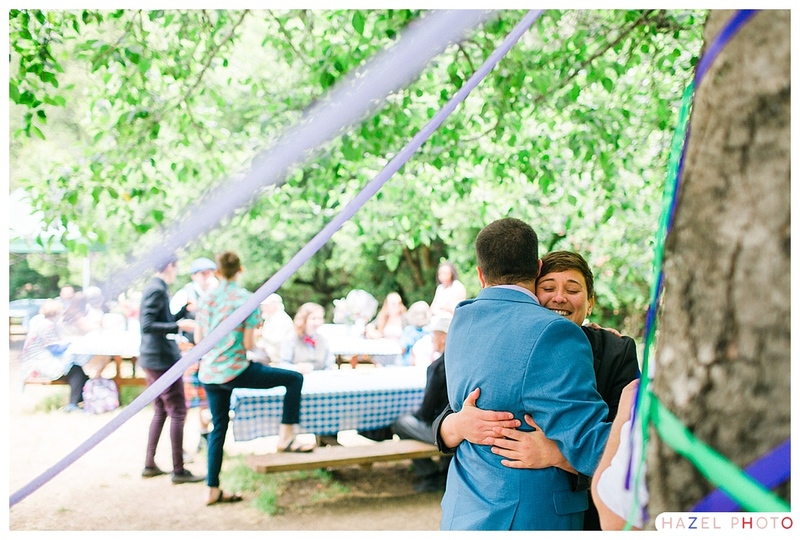 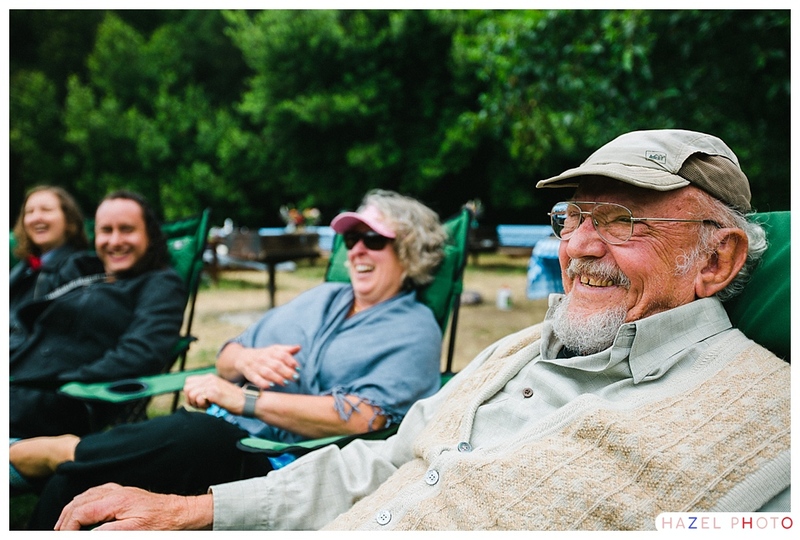 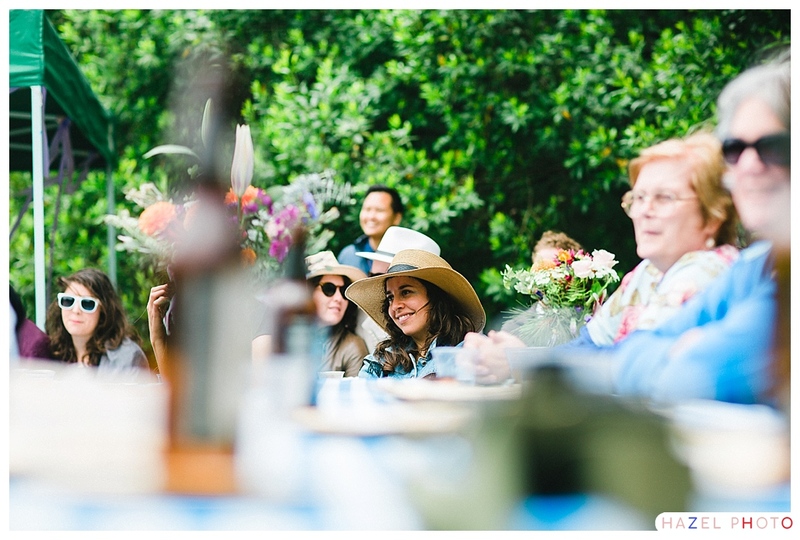 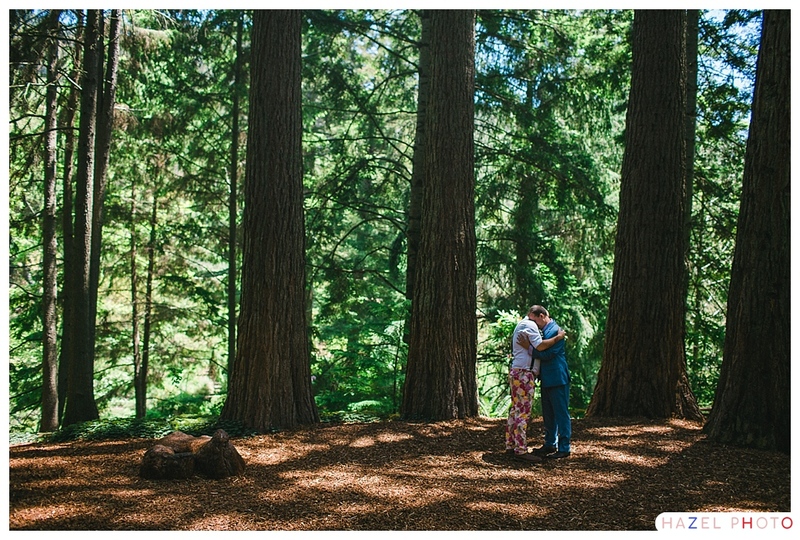 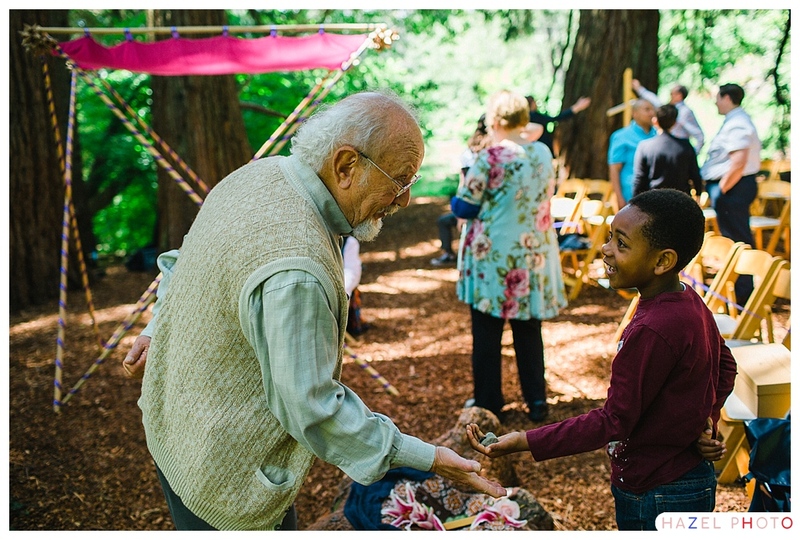 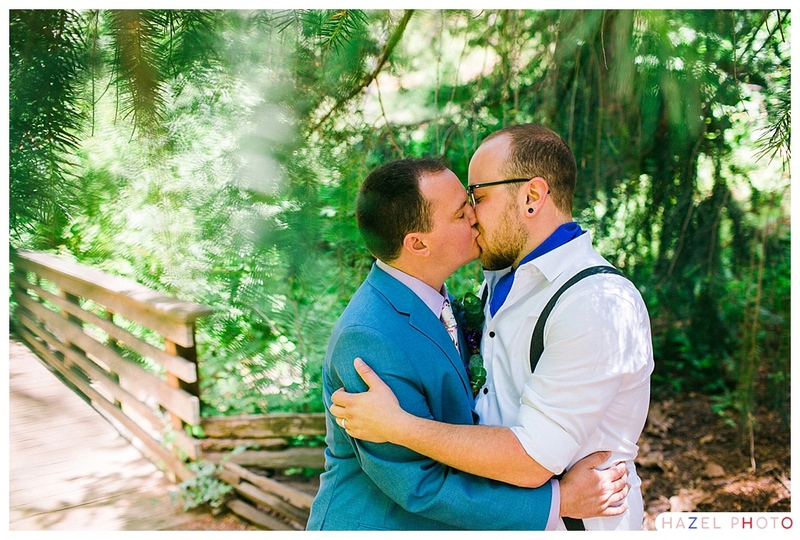 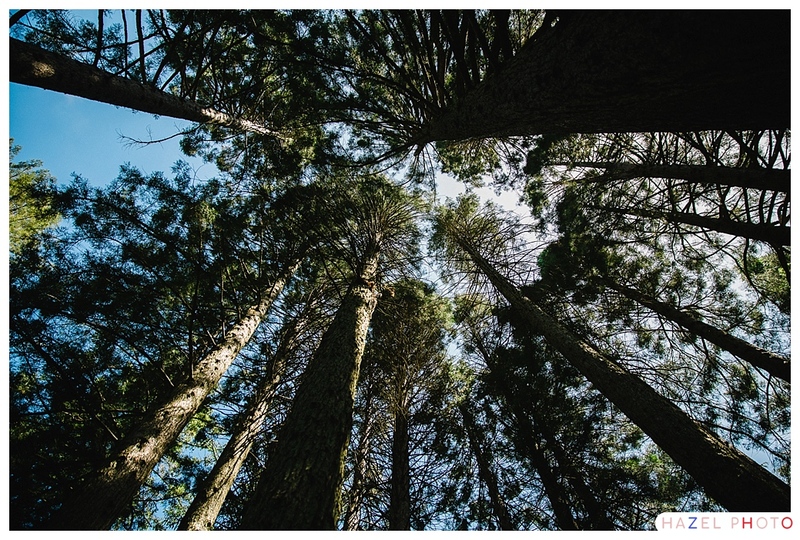 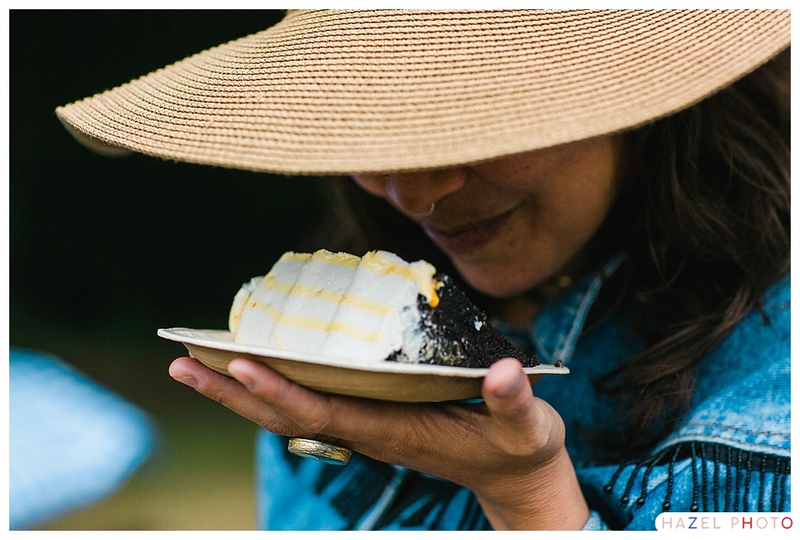 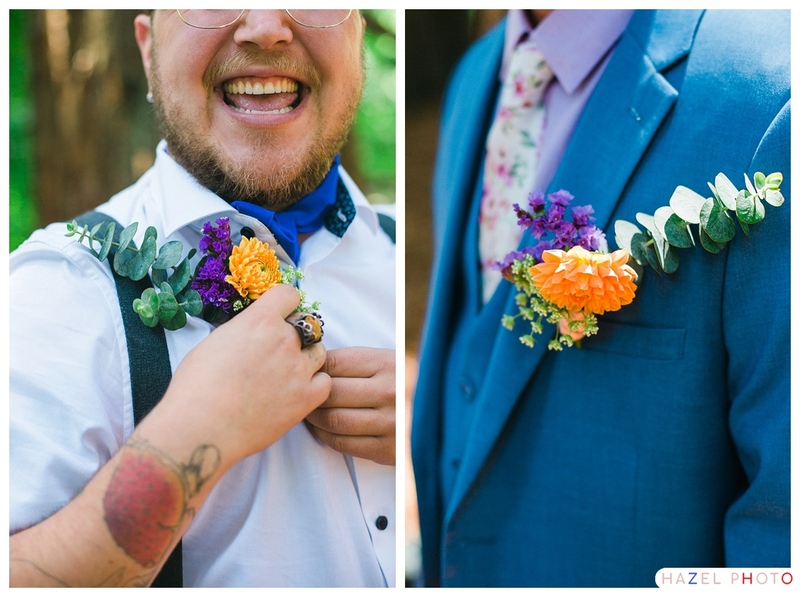 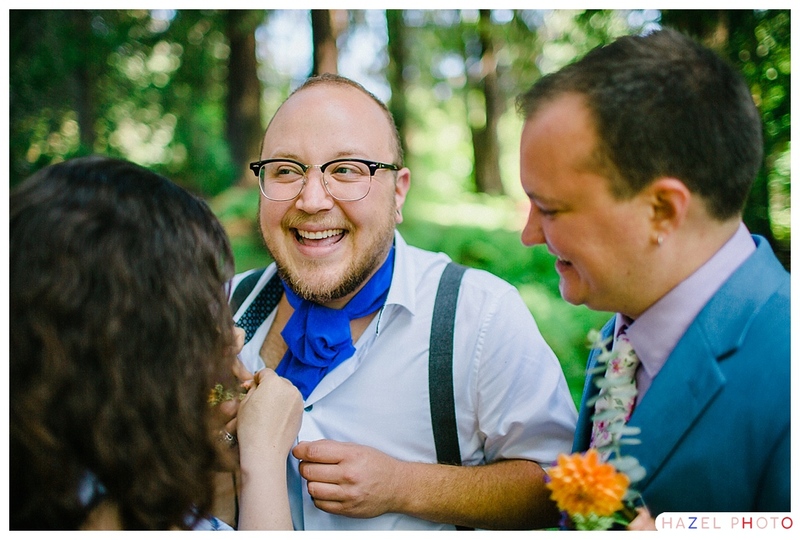 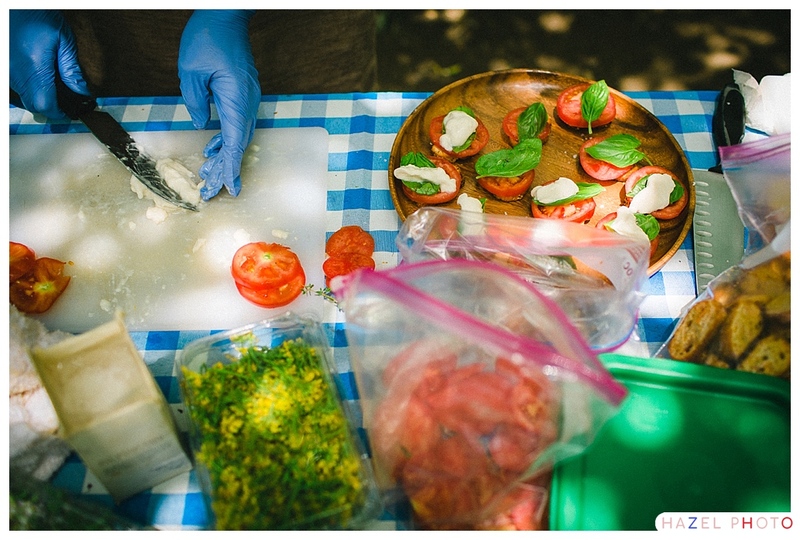 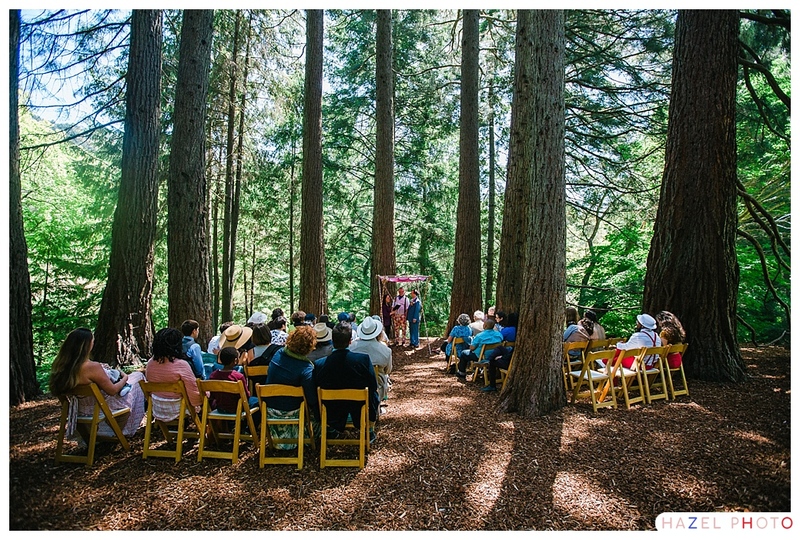 Eli and Tobie were married in a shady grove of towering redwood trees in the East Bay Regional Parks Botanic Garden in Berkeley, California. 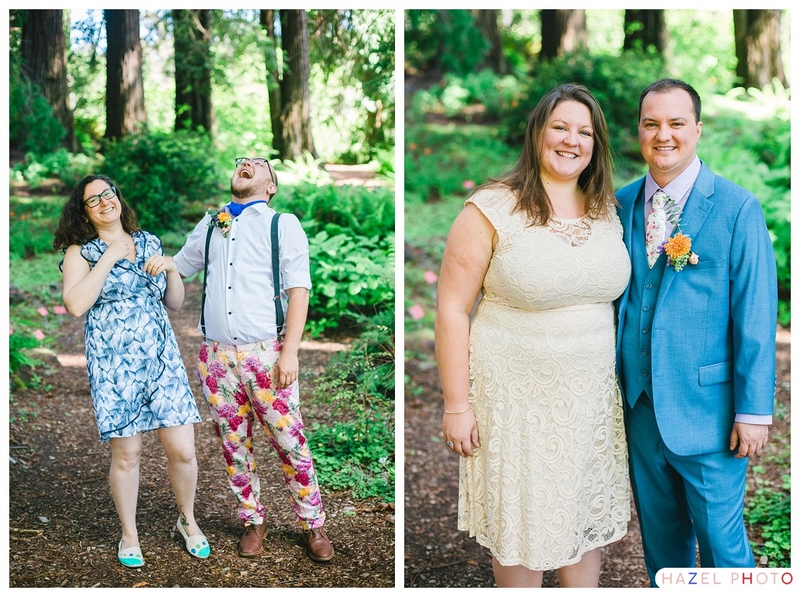 They are both super charismatic, and they were great in front of the camera. 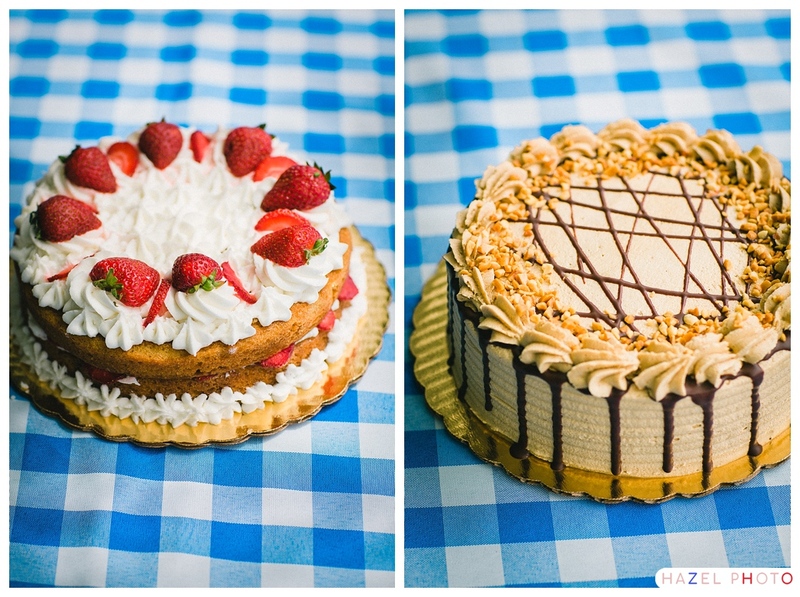 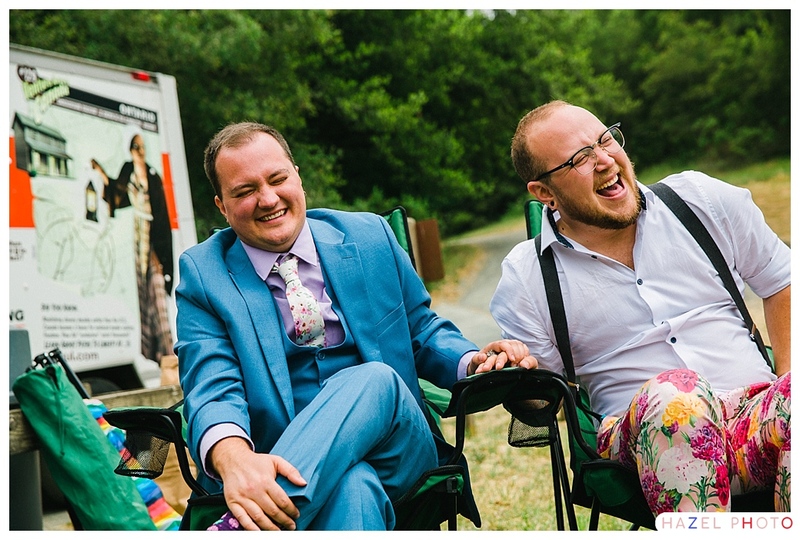 When the connection between a couple is electric, like it is between Eli and Tobie, my job is easy. 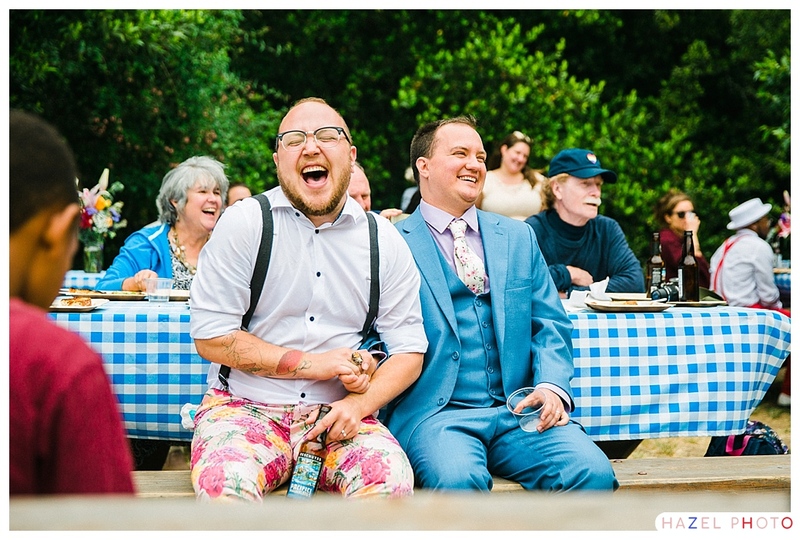 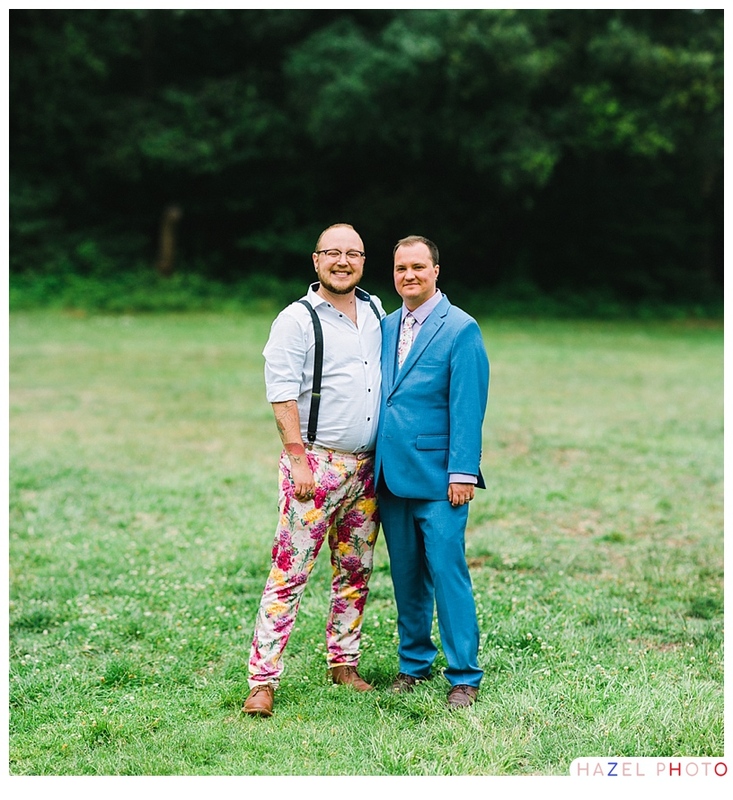 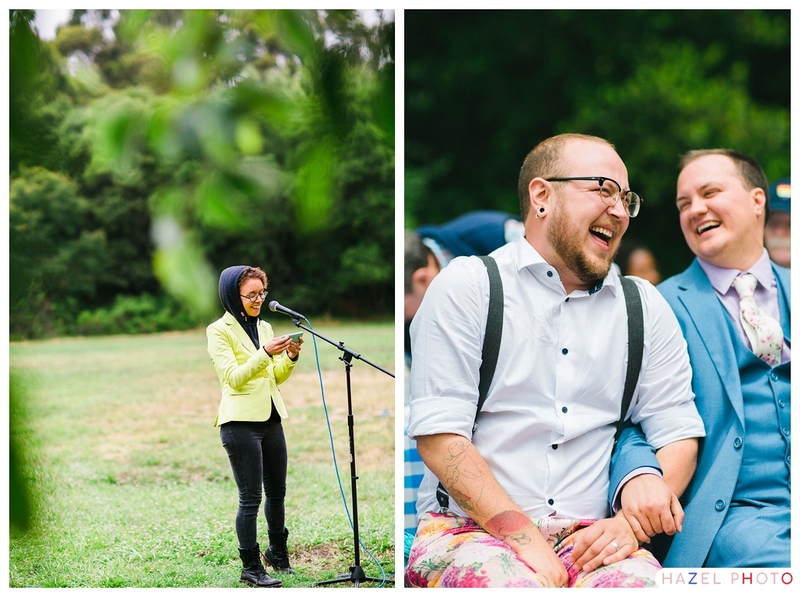 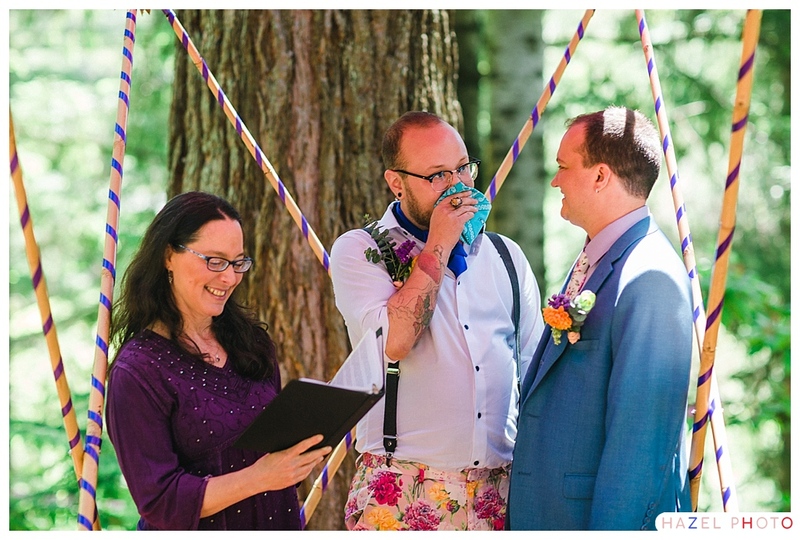 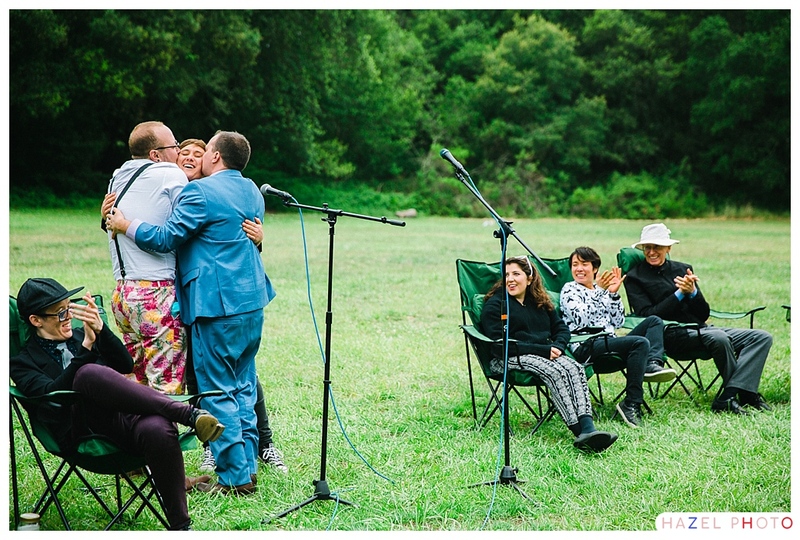 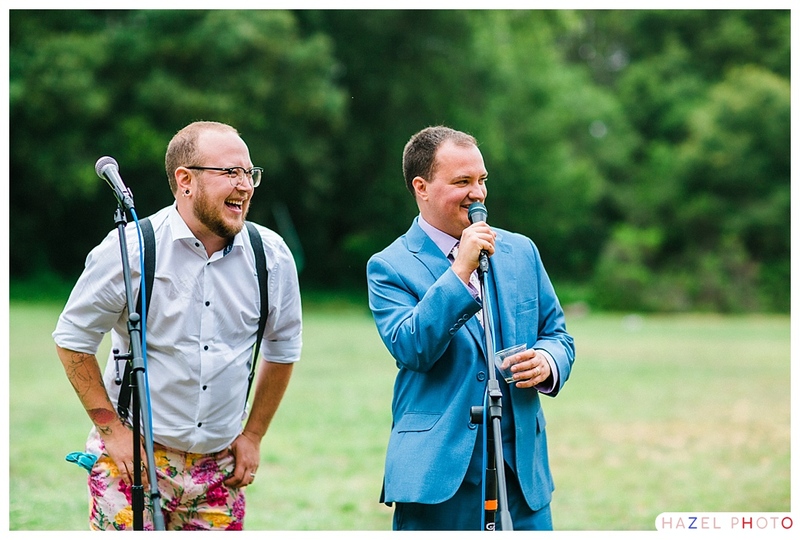 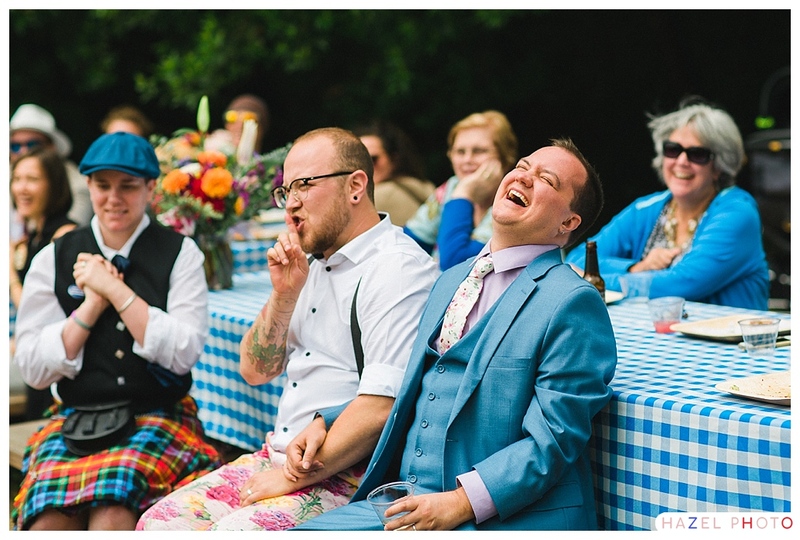 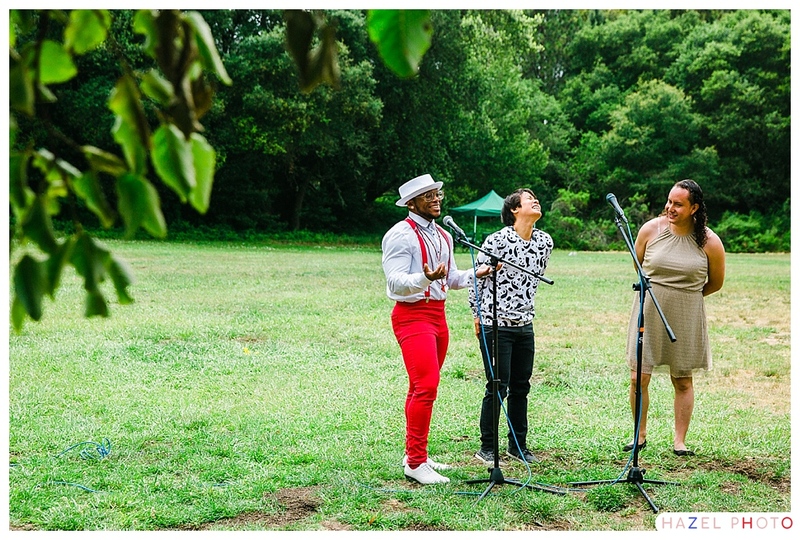 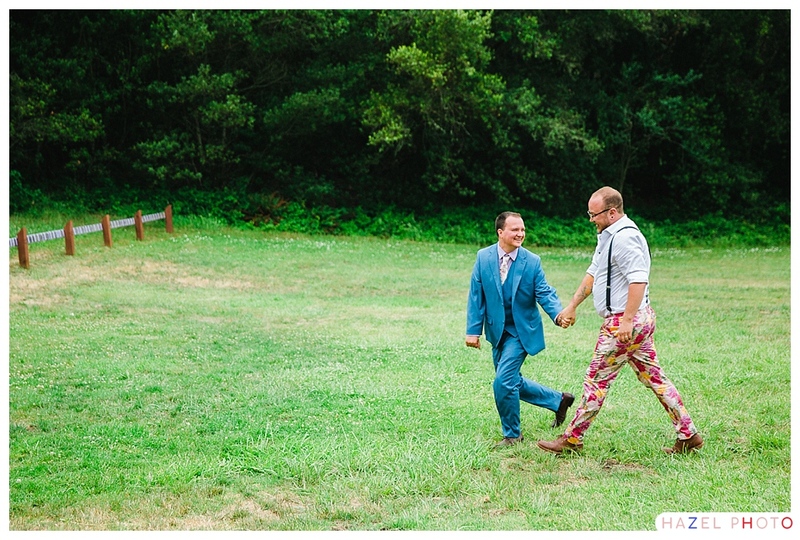 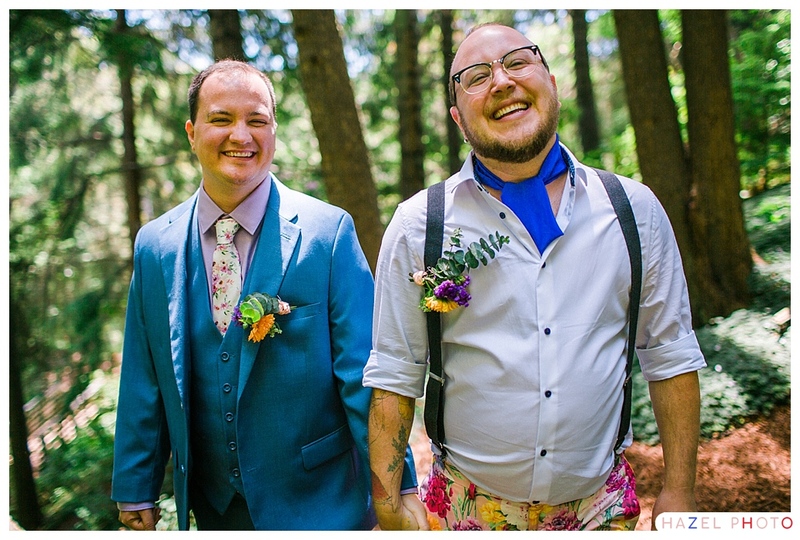 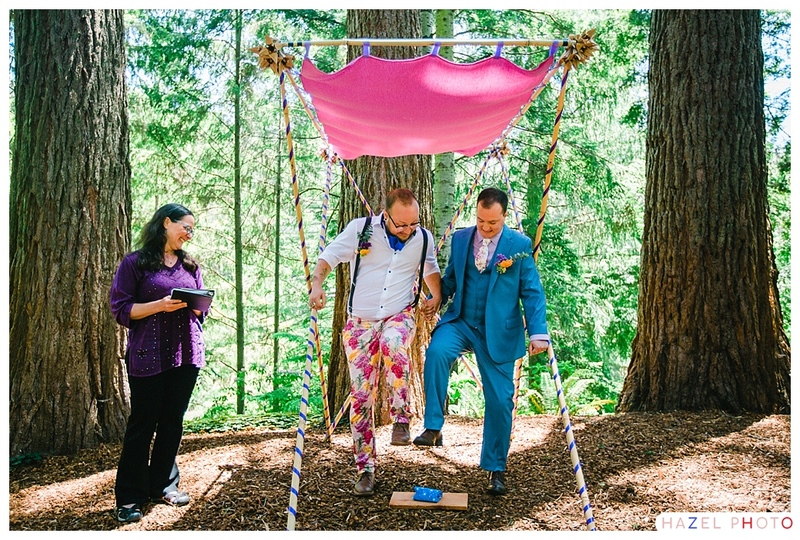 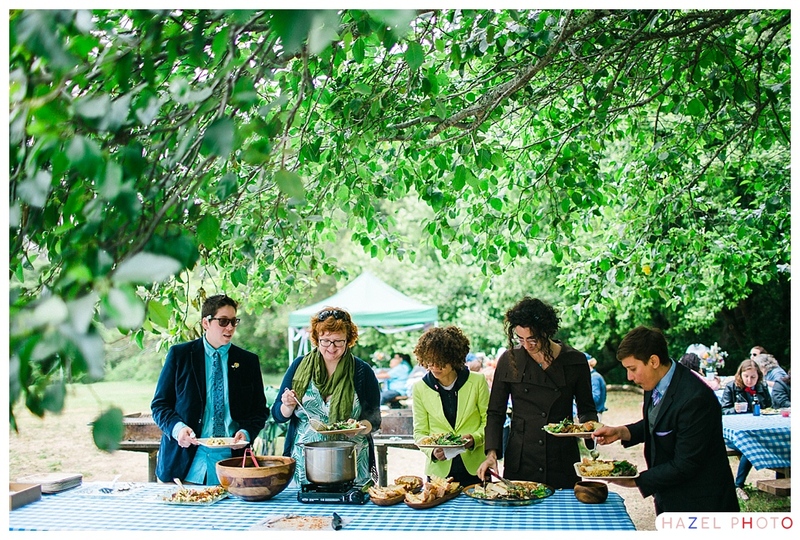 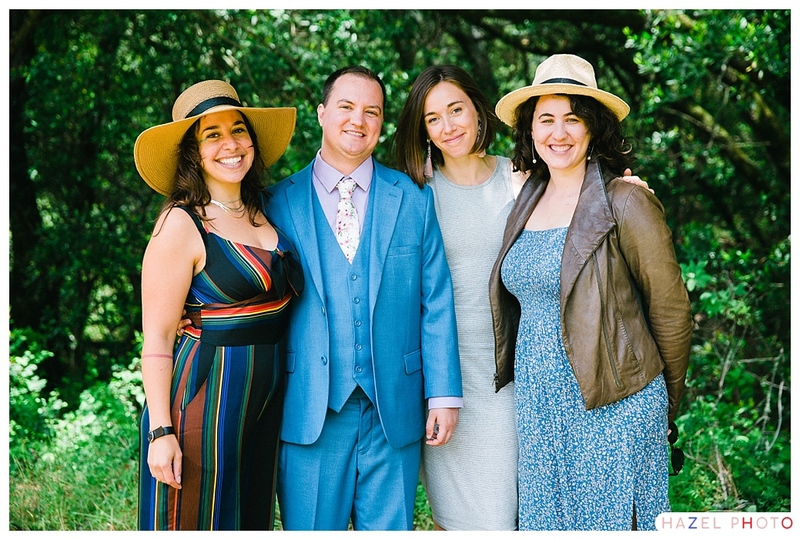 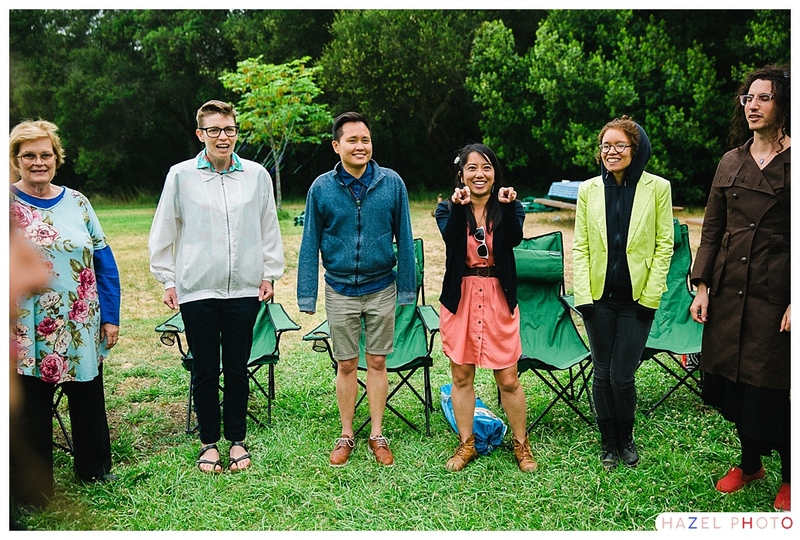 Yes, Eli and Tobie’s wedding was overflowing with glorious colorful outfits, but Tobie’s pants — come on! 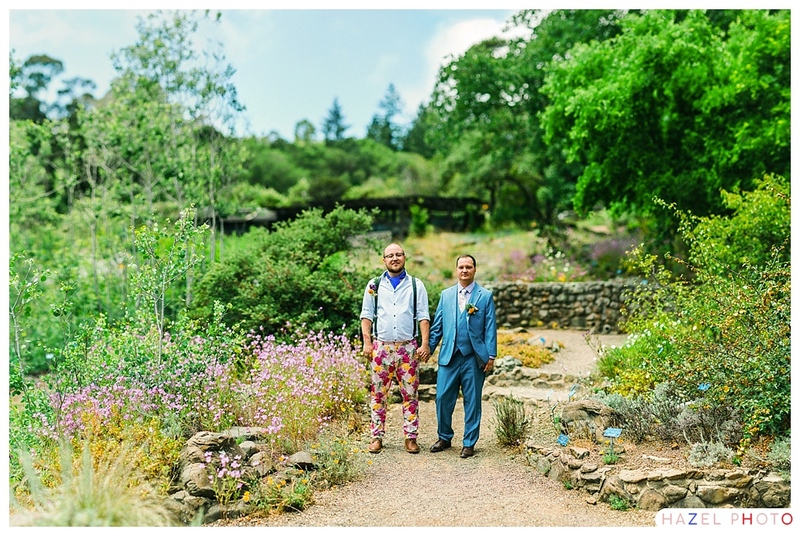 They brought a burst of color to every image he was in. 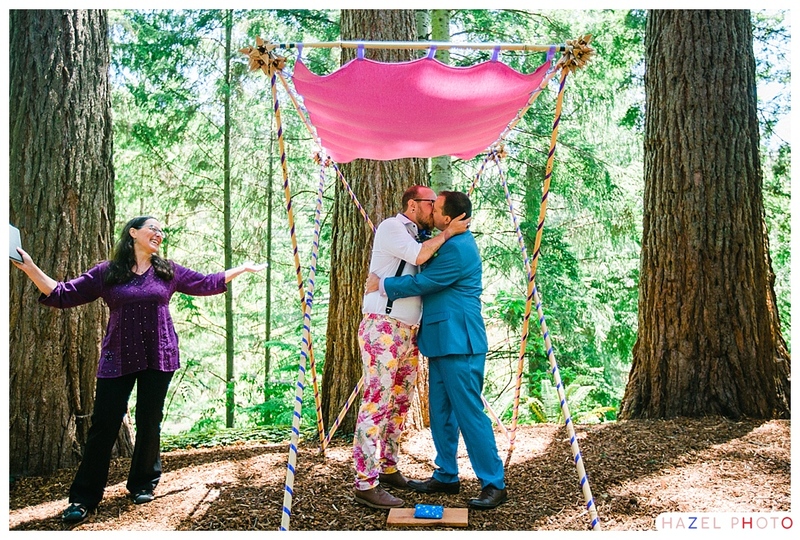 Tobie’s parents constructed a freestanding chuppah that looked like an erector set in the best possible way. 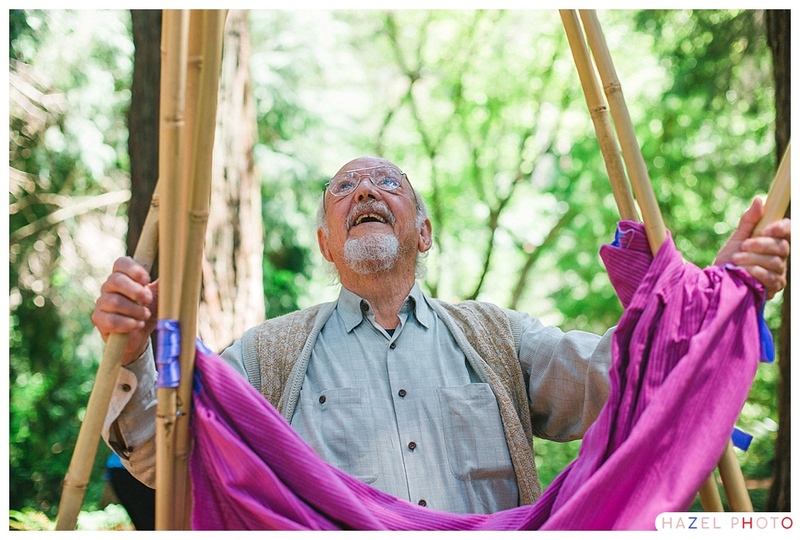 There is one image of Tobie’s dad seeming to summon the chuppah from the earth. 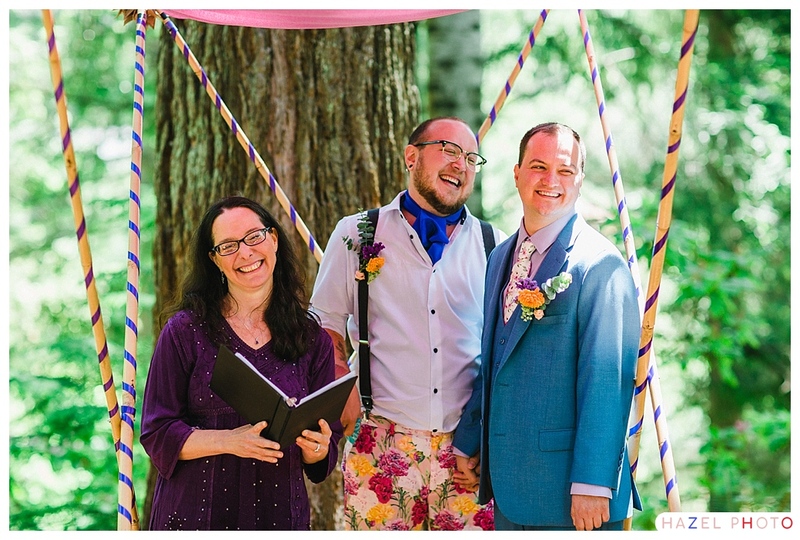 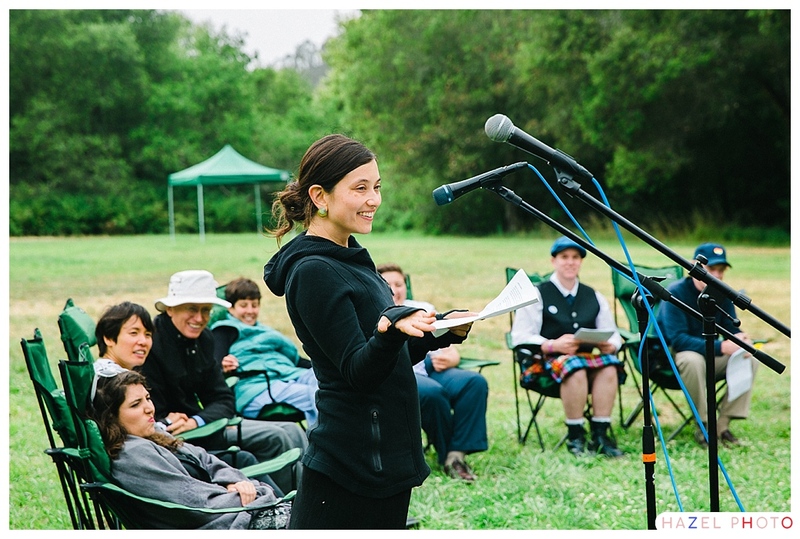 Poems were read, songs were sung, Eli’s family staged a production of the Owl and the Pussycat, replete with costumes and props. 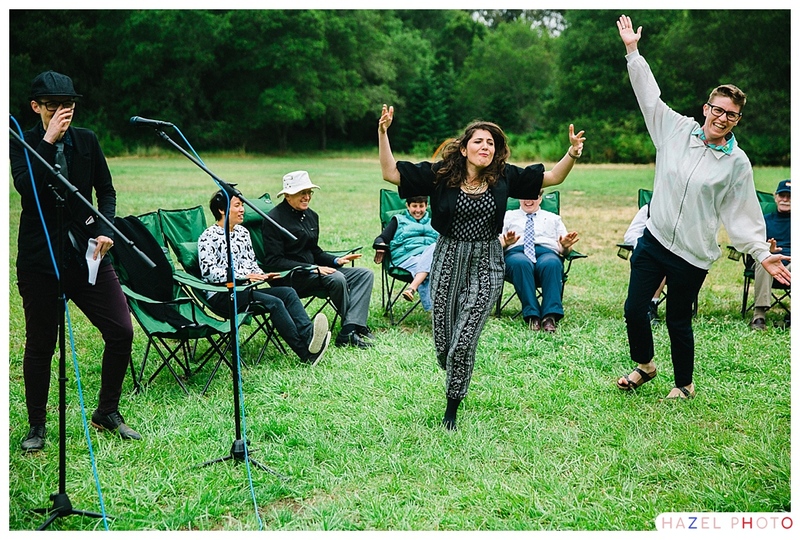 Eli is a talented musician, namely a singer songwriter. 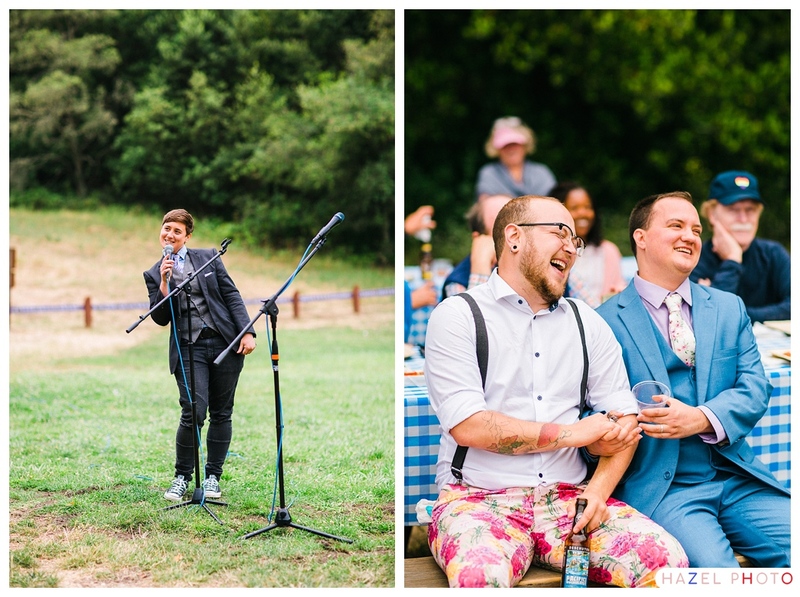 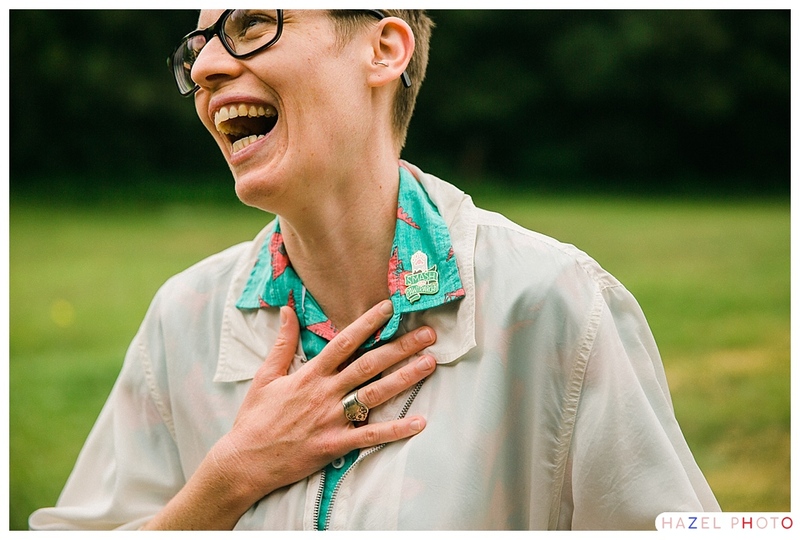 Throughout the ceremony and toasts, there were references to songs Eli had written, including a love song he wrote when he was first falling in love with Tobie. 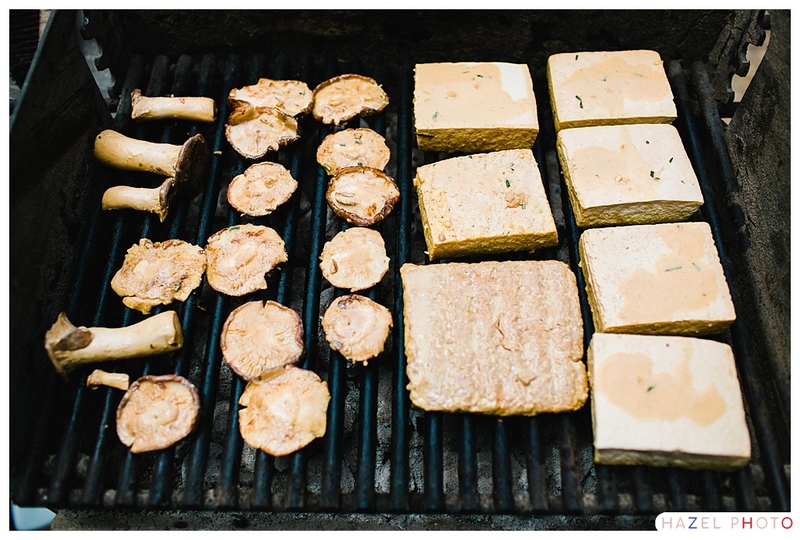 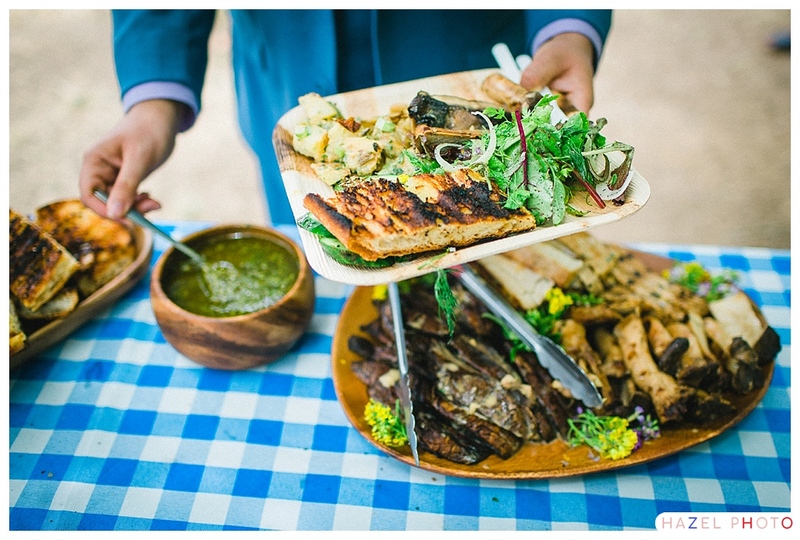 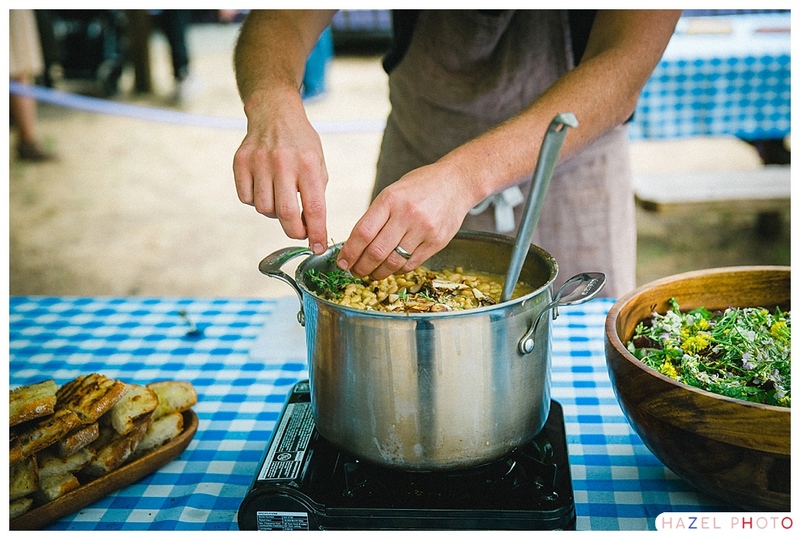 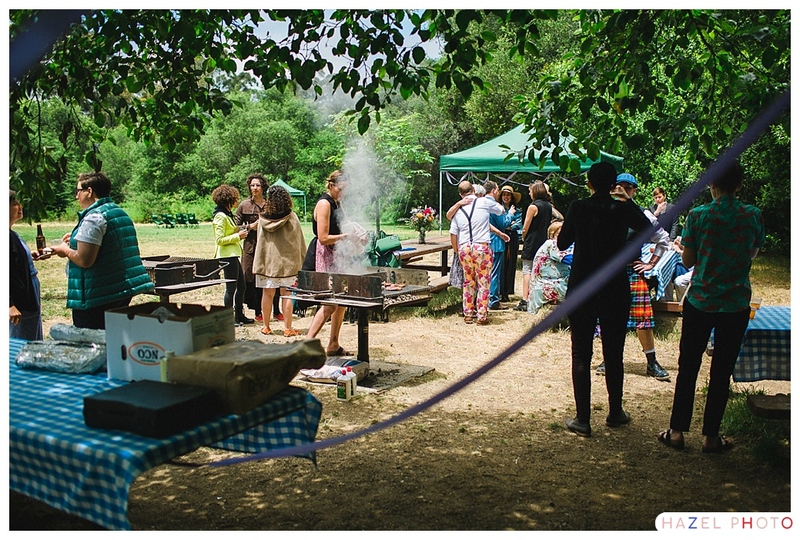 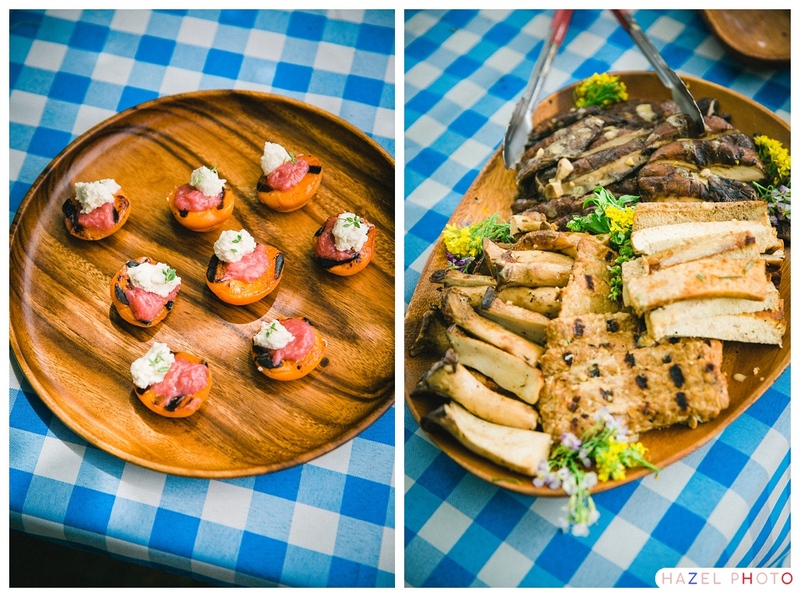 At the reception, guests were served the fanciest, most delicious, vegan barbecue you might ever encounter, especially that chimichurri sauce, yum! 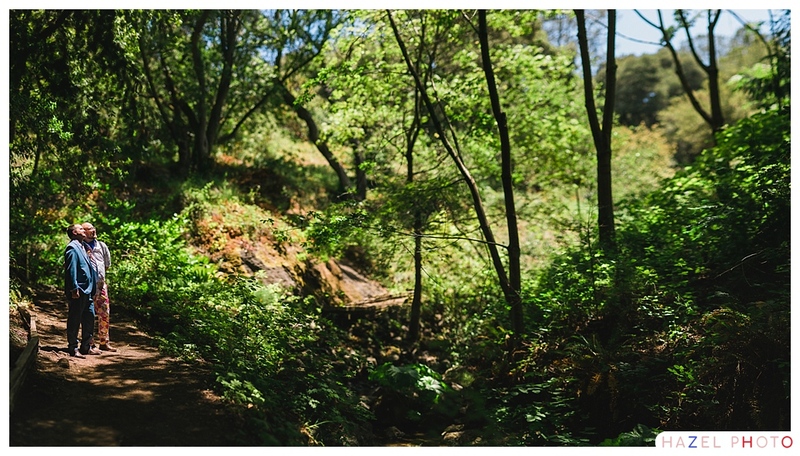 It was a typical Bay Area day, sunny and hot in the middle, cloudy and windy in the afternoon. 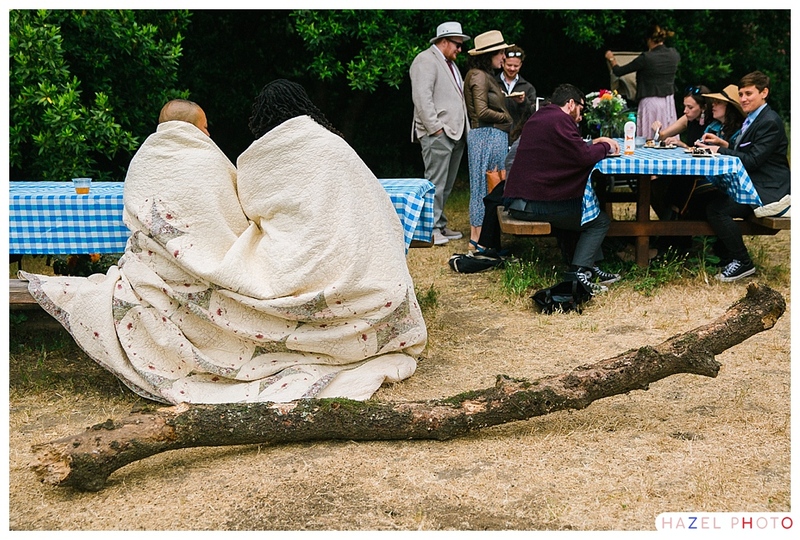 I loved how one couple grabbed their travel quilt and got cozy.